Pörkölt is a Hungarian stew made of boneless diced meat, onion, tomatoes, pepper, garlic and wine. Flavoured with majoram and the colour is given by paprika powder. Pörkölni means to roast, that is where the name of this dish comes from. The most common pörkölts are beef and pork, but of course other meats are used as well like rabbit, lamb or tripe, that version is called pacalpörkölt. Usually it is served with nokedli and pickles. If you add some sour cream you get a so called paprikás. In a paprikás the meat is cooked with the bone included, for example for a chicken paprikás you can use a whole chicken cut into pieces. Today, after all it is a Friday, I decided to serve some fish. I had the sudden idea of a fish pörkölt, that of course I served it with nokedli. I have never prepared fish pörkölt before. After reading a lot of recipes I decided to improvise. Here is my fish pörkölt with a tiny little twist. Chop onion, dice 1 red and half yellow pepper and 2 tomatoes. Heat lard, add chopped onion, thyme, majoram and diced pepper, stew for 5 minutes. Add white wine and let it absorb. 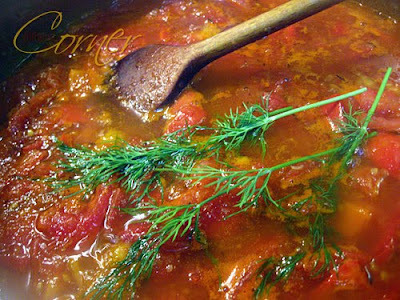 Stir in paprika powder, diced tomato, dill, stock, salt and cook for 20-30 minutes. In the meantime, peel and dice the rest of the paprika. Heat water, cut the top and the bottom of the tomato and leave it in the boiling water for 30 seconds, remove its skin, seeds and dice. Set aside together with the diced paprika. Sieve the sauce, and bring it to cook again until it reaches the desired consistency and season with salt and pepper. Sautee paprika and tomato in white wine, season with salt and pepper. 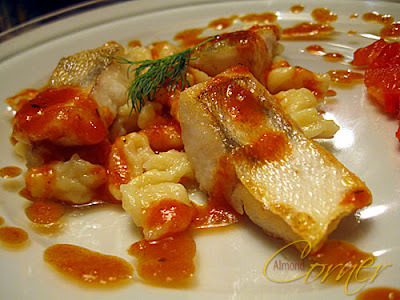 Fry fish and serve it with the sauce, nokedli and the sauteed vegetable. A delicious fish pörkölt! I love learning new terms(and languages) and especially new fish recipes. 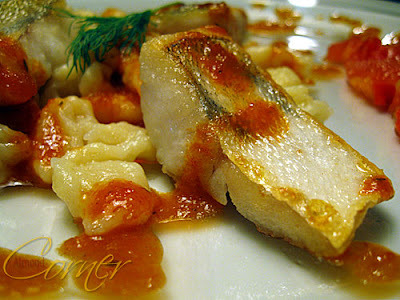 you have a beautiful blog, all delcious recipes and tantalizing photots! Your version is fantastic! That dish looks really delicious and pretty! Thank you Ronelle and Rosa! Nice improvisation- the fish turned out really beautifully! I wanna try this! I have never heard of this dish, but it sure looks yummee. Your plating is beautiful!! !